Traces can be created automatically. The parameters are: number of days prior to arrival; and source of business code (or blank). For example, you can create one for 60 days prior to arrival, 7 days prior to arrival, etc. You can apply them only to guests with source of business code LEIS, for example. You may set up as many as you wish. The auto-traces will print on the Trace Reports for the dates applicable. Auto-traces will have a subject line only. You may bring up the Trace from within a guest's profile and add detail to the trace if necessary. Separate traces can be set up for different Source of Business codes. For example, you can set up a "DEPOSIT DUE" trace for Source of Business LEIS and a "SEND POLICIES" trace for Source of Business SMER. An auto-trace set up without a source of business code will apply to all reservations with source of business codes not defined in Auto-Trace setup. Auto-Traces will print on the Trace Report. The appropriate trace will print for the date range printed. For example, if a guest is due to arrive on 12/15/15, the 30-day trace will print on any report with begin and end dates within the range of 30 days prior to arrival. Since 11/15 is 30 days before 12/15, a Trace report that includes 11/15/15 would include the 30-day trace for that guest. If a reservation's arrival date changes, the auto-trace dates will change correspondingly. If a reservation is cancelled, the auto-traces will be cancelled and deleted automatically. Enter the number of days before arrival to apply the trace. Enter an optional source of business. If you enter a source of business, then reservations having that source of business will receive this trace. If you leave the "Business source" field blank, then all reservations will receive the trace except for those reservations with a source of business defined in the Auto-trace Definitions setup. In the "Trace subject" field enter something that will be a quick reminder to you so that you will know what the trace means. For example, if you receive three deposits, it will be helpful to have three auto-trace subjects (1st deposit, second deposit, last deposit) rather than just one subject such as "Deposit". Below are two sample auto-trace definitions. The first has no source of business and the second has a source of business designation. You may look up existing auto-trace definitions by clicking the magnifying glass look-up icon. A list of definitions will display. 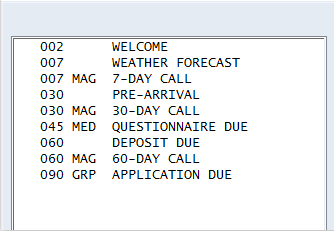 The columns are number of days prior to arrival, source of business (or blank) and description of Trace Subject. Below is a guest's profile that has been populated with auto-traces. Below are three samples from Trace Reports .